Firefighters may not rush into your burning home or business as quickly if there are solar panels on top. "Any kind of delay can affect our ability to rescue people or our ability to extinguish the fire," said Chief Jeffrey Winward of the fire department in Lowell, Massachusetts. Winward says crews may take longer to assess a scene before going in because he'd rather see a structure burn to the ground than put firefighters at risk of electrocution. "It is enough to seriously injure or kill someone," he said. In New Jersey, firefighters let a Dietz & Watson warehouse burn for 29 hours in 2013 rather than tangle with the rooftop array. If they had inadvertently cut through the system's conductors, solar experts say it would have been like cutting into a live wire. "Large amounts of current, arcing current," explained Paul Lyons, who heads Zapotec Energy. "It'll melt tools, it'll kill people." Lyons says in Massachusetts, solar companies like his must include rapid shutdown switches in new installations. The shutdown dissipates electricity feeding from the panels into the building within 30 seconds. But Ken Willette with the National Fire Protection Agency says even if you cut the system power, the panels themselves still produce electricity. "Solar panels work under any kind of light — whether its daylight, streetlight — even the lights off the emergency vehicles," he said. "The larger the system, the more panels, the higher the voltage." 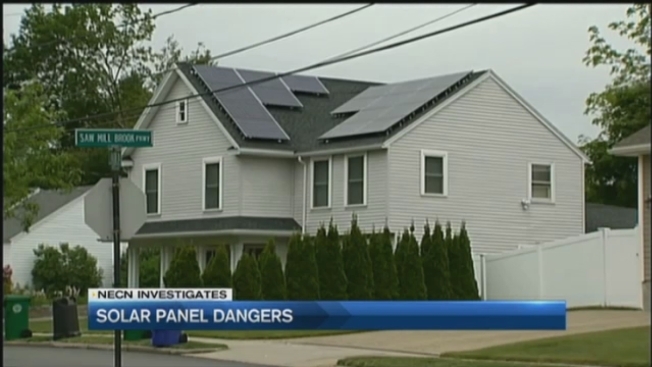 The only way to eliminate this danger, experts say, is to have rapid shut downs at each individual panel — a far more expensive solution. It is expected to be debated as part of the 2017 National Electrical Code proposals, but it can take years for those codes to be created and for state to adopt them. "It can be very contentious, because everyone has different agendas and they approach it differently," said Lyons. "We are in the solar industry, we want to install more solar, that's how we make money." Residential and commercial solar installations have jumped in Massachusetts nearly 5,000 percent in the last five years, so firefighters are encountering solar more and more. Lyons insists crews battle in all kinds of conditions and, with proper training, can minimize risk. He adds that misconceptions are fueling firefighter concerns $mdash; like the fear that they will be easily electrocuted if they spray water on "live panels." "It's possible," Lyons said. "Is it probable? No. It's highly improbable." But firefighters say perception is reality if they're hesitating when they see solar and want changes now. "Our attitude is always to make things safer rather than save money," Winward said. If you're looking to have solar installed, the experts say check the track record of the company, make sure they pull a permit so the project is inspected and alert your fire department that you have solar so they're ready before any potential emergencies.